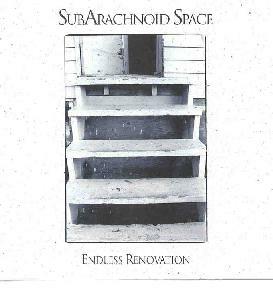 SubArachnoid Space - "Endless Renovation"
SubArachnoid Space's previous releases have been live documents, but for "Endless Renovation" the band entered the studio to produce their first properly recorded work. The band consists of the duel guitars of Mason Jones and Melynda Jackson, along with Jason Stein on bass, Chris Van Huffel on drums, and various guests on organ, synthesizer, violins, dulcimer, cello, and upright bass. While the band's live work on the earlier "Almost Invisible" featured interesting improvisational psychedelia, "Endless Renovation" is a step beyond due to the more fully developed songs, and, to an extent, to the expanded instrumentation on three of the six tracks. The disc opens with "Will You Make My House A Carnival". An eerie organ melody leads the band as the guitars solo slowly along. Strange voices are introduced which soon become a small crowd. This does indeed sound like a carnival, though perhaps as the soundtrack to Carnival of Souls or Circus of Horrors. The taped voices and various sounds are used to good effect and add to the dark atmosphere. Even on the live "Almost Invisible" the various sounds the two guitarists could wrench from their instruments was apparent and is even more apparent on this studio effort. The next three songs all feature stripped down double guitar, bass, and drums. Space. On "Square Wheels" the bass lays down a low-end Univers Zero style melody line and the guitars blast off from there. This music is among spacerock's darkest and is not for the timid. A trademark of the band's sound is the combination of fuzz freakout guitar with soloing acid licks which, at it most intense moments, creates a sonic wall of powerfully earth shattering psychedelia. The other two tracks, "Good Grief?" and "Stereo Saturation", are more of the same though Saturation again features a simple, but interesting bass line around which the guitars can develop themes. It also has very quiet moments during which the guitars perform their cosmic constructions in the subtlest of manners. And when the pace picks up again they blast straight into orbit with very slow, but heart wrenching acid licks. The last two tracks, "Safety In Numbers" and "Twilight Sleep", blend together so smoothly that they really make up one 30 minute epic. These are the tunes that include most the expanded instrumentation listed above and the use of these instruments is often difficult to discern, though there's no mistaking the freaky cello sounds on "Twilight Sleep". There is a lot of elusive detail on these tracks and I only came to appreciate them after listening again with headphones. I recommend you do the same. Though SubArachnoid Space falls into the droning wall of noise psych category, I found the music on this disc to be much more in line with my conception of acidic spacerock than other such bands due to the clarity of the individual instruments, the creative use of the two guitars, and the better development of the music (something I asked for after hearing "Almost Invisible").